Manufacturer, exporter and supplier of foil embossed labels, woven labels and badges, barcode sticker and multi colour stickers etc. 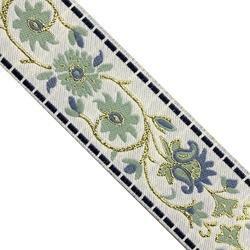 We are amongst the most reputed names in the industry, offering Metallic Jacquard Ribbon. Mahalaxmi Labels produces a range of printed labels for businesses on a global scale. 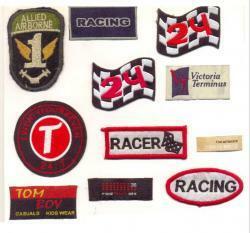 We offer top of the line custom printed labels on a wide variety of fabrics. Mahalaxmi Labels produce printed labels on number of fabrics like taffeta, polysatin, Tyvek, cotton tapes, canvas Gross Grain with effects like, sparkle, puff, foil printing. Mahalaxmi Labels produces quality printed labels with a lot more detail and color as compared to the run of the mill roll form.The effect that our labels are significantly more vivid in finish. Chose your size, material, colors and much more to add to a unique custom label design. Mahalaxmi Labels is now offering Inserts & Inlays! We offer any size that you needto value your products. Our latest techniques give perfect presentation of color, We matched fabric tone on Inserts & Inlays with co-operation with clients, Inserts & Inlays are printed with on card board till 400gsm with vibrant colors to make rich appearance on product. Inserts & Inlays provides professional branding image what business deserves. Inserts & Inlays are shape colour size impact as per requirement Gloss, Matt, sport lamination, grinning, foiling, embossing & more as per clients requirements. Our reputed entity is engaged in supplying Taffeta Ribbon. Woven Labels has traditionally been an accessory for the main garment and are the creators of brand value of the garment. Thus it constitutes an important role in Garment manufacturing and is used by both the Garment Exporters as well Domestic Garment manufacturers. Clients can place them on purses, luggage, rugs, towels, toys, promotional items, bedding and more. Mahalaxmi Label specializes in the production of woven labels. Everything we do is 100% custom, ensuring your logo, lettering, and colors are woven as accurately as possible. Whether you are an established company or a brand new start-up, cruz Label can help you brand your items with woven label that will fit your needs and budget. All of our woven labels come to you in roll form, cut, finished, folded and laser cut ready to sew on products. This special effect will give your product promotion the upscale look it deserves. Foil Stamping and Embossing provide that "extra touch" that can take an existing label design over the top. By adding an embossed foil label or sticker to your product, you're making a statement that gets noticed every time. Foil stamping and embossing are used to highlight your packaging and separate it from the many other products on the store shelves. Candy and confection labels, food labels, anniversary labels, wedding labels, special occasion labels and promotional labels. These foil embossed labels can be provided on rolls and in cut form maximum cut till 18" & more as per quantity of clients. The superior quality of our ribbons will reflect the distinctive value of your product. Strikingly beautiful and attractive, the wide array of ribbons and fancy ribbons available with us are made from nylon, lurex, polyester & viscose fabrics and are known for their finish. These ribbons in organza, silk and velvet fabrics find their usage in a number of decorative and gifting purposes. Fancy ribbons define the moment. Sheers, metallics, gold accents, stripes, plaids, and florals help establish your apparel, package or decorative item as unique and crafted with care. We offer sophisticated patterns and textures for a wide variety of needs, and the superior quality of our ribbons will reflect the distinctive value of your product. We offer Packing Tapes in varied color range. They are available in small as well as in jumbo rolls. They are great for long term storage packaging, label protection and light-duty shipping. They have soft touching grip and writable surface. Plastic industry, Automobile industry, steel industry, and Healthcare industry and many other industrial and commercial needs. Destructible Labels for the electronic, automobile, spare parts and computer hardware industry. Labels can be printed in many different languages like (SPANISH, FRENCH, ENGLISH, PORTUGUESE, FLEMISH, ITALIAN, GREEK, JAPANESE, HUNGARIAN, GERMAN, CZECH, POLISH, DANISH, ESLOVENIAN, BULGARIAN and much more) with our label designing and printing softwares with multilingual support. Our system also supports all commonly used database formats. Our softwares are also capable of printing labels with serial numbers just at the click of a button. Serially numbered labels can have multiple serial numbers with different jumps on the same label. Sequential numbering can be numeric, alphanumeric or hexadecimal. Serially numbered barcodes can also be printed with the same ease by our highly advanced label printing programs. All printing and packing processes are done by trained staff to maintain consistent high quality and fast delivery. Packaging printed Boxes & Paper Bags are very high quality bag suitable for retail purposes or a promotional business marketing tool. There are main choices of paper colour with up to 100% ink coverage as required - internal printing available too. Packaging paper bag Printing color: Pantone colors and the common 4 colors (CMYK) process. Finish of Packaging paper bag: Gloss/Matt Lamination, Colour Stamping, Embossing. Packaging paper bag with Delicate design, fine craftsmanship, high quality, reasonable price. Artwork: Customer designed artworks are welcome, we can design artwork that follow your comments too. The size of the carrier can be to the nearest although we will advise of similar alternative styles that may work out cheaper due to the manufacturing methods used. Handles can be polypropylene cord, cotton rope, twisted paper, fabric, PVC tube, or any suitable material. Handle lengths can be short 'hand only' up to full shoulder length. Advertisement Bag, Christmas Gift bag, Shopping bag etc. 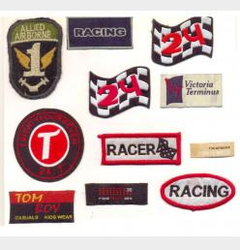 Woven Labels has traditionally been an accessory for the main garment and are the creators of brand value of the garment. Thus it constitutes an important role in Garment manufacturing and is used by both the Garment Exporters as well Domestic Garment manufacturers. 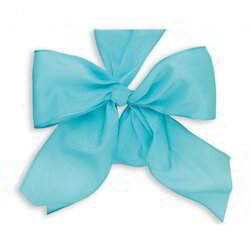 The superior quality of our ribbons will reflect the distinctive value of your product. Strikingly beautiful and attractive, the wide array of ribbons and fancy ribbons available with us are made from nylon, lurex, polyester & viscose fabrics and are known for their finish. These ribbons in organza, silk and velvet fabrics find their usage in a number of decorative and gifting purposes. Mahalaxmi Labels is now offering Inserts & Inlays! We offer any size that you needto value your products. Inserts & Inlays are printed with on card board till 400gsm with vibrant colors to make rich appearance on product. Inserts & Inlays provides professional branding image what business deserves. Inserts & Inlays are shape colour size impact as per requirement Gloss, Matt, sport lamination, grinning, foiling, embossing & more as per clients requirements. We offer RECYCLED PAPER FOR INSERTS & INLAYS with different size, colour and shape. Customer designed artworks are welcome, we can design artwork that follow your comments too. Our professionally printed Inserts & Inlays are an economical brand recognition tool. Inserts & Inlays used in conjunction value to your products by strongly identifying your brand on display.